So, here it is!! 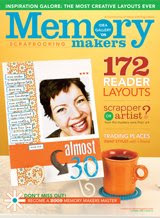 I found out several months ago that I was going to have 4 layouts published in the Memory Makers Scrapbook Idea Gallery 2008 and have been anxiously awaiting its publication ever since then. They posted the cover of the special issue on their website just the other day and stated that it is set to hit newsstands on July 8th. I received my subscription copy in the mail yesterday! Of course I had to immediately flip through it on my lunch break to find my pages! I can't wait to look through it a little more leisurely as I could see that there were a ton of other beautiful layouts in there. I will be sharing the published pages with you here soon!! I did request a few extra copies and plan to give away one or two copies here on my blog, but not exactly sure when I will receive them. It may not be until I get my layouts back, so we'll just have to see. I got some other good news last week. I received an email from Holly at Scrapbook Trends requesting one of my layouts for their November 2008 Issue, so am quite excited about that. I have been submitting to Scrapbook Trends for quite some time, but this is the first time that I will be published by them.